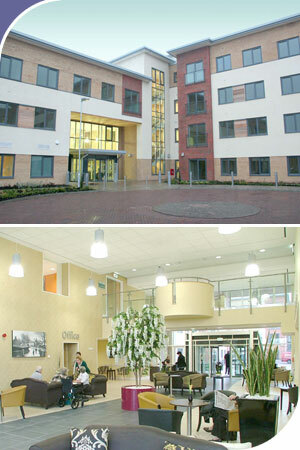 Work is now complete on the award winning Retirement Village in Stoke on Trent. The Village has 100 two bedroomed apartments built around and over a central ‘Village Hub’ with a Restaurant, Bar, Shop, Hairdressers, Fitness Suite and Craft Areas and also includes a 14,000 ft2 two storey headquarters office development for Staffordshire Housing Association. The development is located on the former Portmerrion Bilton Works pottery site on London Road. Situated on one of the main gateways into Stoke, the West End Village will integrate with the community and provide some shared resources for the residents, office staff and local people. It has been a catalyst to regenerate this area of the town, as well as a key element of the city’s strategy to meet the future housing needs of older people. The village is a £16 million partnership project being funded by Staffordshire Housing Association, Stoke-on-Trent City Council, the Homes and Communities Agency and RENEW North Staffordshire. The project was recently awarded the BREEAM ‘Excellent’ award for sustainability. The village has also been named the “Most Outstanding Extra Care Housing Complex in the UK” for 2011 in the annual Over 50’s Housing Awards.